Please Note: Our Customer Service Representatives are not licensed brokers and cannot offer any personal financial advice. The password is given to you once you sign up for the service, and is also listed in each monthly issue and weekly update. Please confirm you are using the correct password. I'm not getting issues emailed to me. For your convenience, we mail and email each monthly issue to you. Sometimes your junk mail or spam filter catches your subscription emails. Check your junk folder and make sure memberships@reply.newsmax.com is on your contact list to avoid this in the future. When I click on the links for the reports they won't open or read corrupt. It could be that your Adobe reader needs to be updated. If you don't already have Acrobat Reader, you may download here http://get.adobe.com/reader/. There is no charge for this. Right click on the report you are interested in viewing. Left click on “save target as.” When the next box pops up make sure you change the “Save in” box up at the top to “Desktop.” From there click “save” on the bottom right hand corner. Then, minimize your screen to show your desktop, find the icon that is related to the file you saved, and click to open. The email is not printing correctly. Just like a computer, printers need software updates also. If you go online to the printer manufacturer and enter the model number of your printer, they should have updated software to download for free. If you are having difficulty finding the information, contact your printer manufacturer directly for assistance. How do I get started with investing in the recommendations? You started the first step by joining The Dividend Machine. Congratulations! Any of the securities listed (stocks) can be purchased through a broker — online or by phone. I am looking at the portfolio. How many stocks or options should I buy and which ones? It is really up to you and your investment comfort. We suggest subscribers discuss with a financial adviser regarding which investments are best suited for them. We do typically recommend a buy, hold, or sell price. This is our opinion only. We are not familiar with your personal financial situation. The stock you recommend is above my "buy" price. What do I do? We believe the best thing to do is wait until the price drops down to our recommended "buy" price. What you ultimately do is up to you. Can you give me personal financial advice? No. We are not financial advisers and cannot give you personal financial advice. Each person needs to make their own decisions on what to invest in. It is important to collect as much information as possible before making an investment decision. Our recommendations are our opinion only. The Dividend Machine made a recommendation on a particular stock/option and I need more information about the company. Where do I find it? We always conduct a detailed evaluation of each recommendation. The website is filled with current and past recommendations which have the information you are looking for. If you look for the date we acquired a stock in the portfolio, chances are you can look at the prior recommendation to get the full story. Otherwise, there are plenty of websites available to do research on the stocks/options we recommend. The easiest thing to do is just "google" it. Go to www.google.com and do a search on the stock. I really want to see the bonus report I read about. Is that being sent to me? There are many bonus reports and they are all available online in the Special Reports section. Simply log in and read it online. We do not mail out the bonus reports. I am looking for a specific report. How do I locate it? Recommendations are usually listed in the order that they come out. The newest one will be on the top. Special reports are usually located underneath the trade recommendations. Some of our services also have weekly updates. Customer Service Hours: Monday thru Thursday, 8:30am to 6:00pm (Eastern); Friday, 8:30am to 5:30pm (Eastern), Closed Saturday and Sunday. All of these individuals subscribe(d) to The Dividend Machine newsletter at the time of the recording. Newsmax has not verified the accuracy of these individuals' representations of their investment returns. Any profits that these investors may have realized may not be typical and may be offset by other losses. Newsmax makes no representation that your results will be similar. Newsmax paid for the traveling expenses — including flight, meals, and lodging — for these individuals in order to record them. 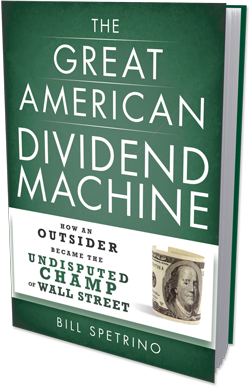 Order a copy of Bill Spetrino’s brand-new book The Great American Dividend Machine. Build the optimal, income‑generating investment portfolio using the power of dividends to achieve absolute financial security. 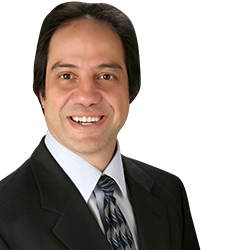 In The Great American Dividend Machine, Bill Spetrino proves his investment philosophy will provide for a solid and secure financial future. Copyright © The Dividend Machine, All Rights Reserved.